They say what you focus on expands. I certainly hope that doesn’t include my rear end because that’s been my focus for a while. However, I do believe the power of positive thinking is a discipline as challenging as eating clean for 3 months. For a while, because of a rigorous schedule, I had been taking my workouts at home. I started to notice a lack of effort and a disgruntled spirit. The biggest change was the depth of my critiques, I was never satisfied. Not with my effort, not with my body, or my focus. Our bodies and our minds have a relationship, I needed to work on mine being a loving one. Recently, I’ve tried to focus on what I can do, and not what I can’t. As a result of my shift in focus, I found I can actually do more. I try more. I push harder too. It’s hard not to compare yourself or your body to others in the room, so now I’m using it for positive vibes. I see someone working hard in class and allow her hard work to push me to my next level. If you are lacking inspiration for your workouts look no further than those around you. Together we work hard and sweat it out as a team. All you have to do is show up. HIP Studio is a harbor where inspiration of all kinds docks. Each client, each trainer and even the writing on the wall is there as a spark for you to ignite your full potential. I know if I let myself be inspired by those around me, I will reach that potential and beyond. And I know you can too. Less critical, more loving, and opened to inspiration! So you’ve finished the HIP studio 90 Day Clean Eating Challenge! Congratulations for taking the plunge for a cleaner healthier you. After eating clean many of our HIPsters have found they are less bloated, less irritable, less fatigued with less headaches, less digestive issues. They are sleeping better, have more energy and noticing tone in their arms legs and midsections. Feeling this good makes you want to eat clean for life, but once the challenge is gone and there are no more points to be rewarded how to you keep motivated? For one, a lot of the processed stuff you used to eat won’t taste good anymore. Rich food will be richer and sweets will be too sweet. Making clean eating a lifestyle isn’t as hard as you think, especially if you listen to your body and avoid what makes you feel gross. Think about clean eating 80% of the time and leave 20% up for those nights when you crave a burger and a beer or you indulge in a slice of cake for a co-workers birthday. Creating consistency is what promotes change. Don’t undo all the good that you did on the challenge. Just because you can have dessert without deducing points doesn’t mean you should eat a whole cake. Balance in your diet, balance in your life. In meals or calories, 80/20 breaks down like this. 3 square meals per day: 21 meals per week. 80/20 = 17 Neat & 3 Treat meals over the week. 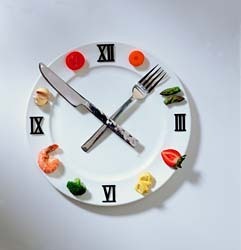 5 small meals per day: 35 small meals per week. 80/20 = 28 Neat & 7 Treat over the week. 2000 calories average per day (daily view): 2000 calories. 80/20 = 1600 Neat & 400 Treat calories per day. 2000 calories average per day (week view): 14,000 calories per week. 80/20 = 11,200 Neat & 2,800 Treat calories per week. Some weeks you might find you’re 90/10 others 70/30, and that's okay! Thank you for completing the HIP Studio 90 Day Challenge with us! Written by: Kayte Corrigan The experts at HIP Studio know that fitness is a life long thing like a marriage, ‘til death do you part, and a good reason why grandmas are looking and acting younger and younger. There are times your relationship with fitness might suffer, times when you’re bored with your fitness, or you just don’t give your fitness enough attention. Sometimes you feel like the romance is gone, but if you’re dedicated to making the relationship work, fitness will have your back ‘til the end, the very end. Live long and healthy so you can see the third generation. 50s: Gravity and metabolism are frienemies now. Women gain an average of 12lbs post menopause and everything else droops. Posture is key, it can certainly age you one way or another. If you haven’t started strength training by now, get right on it. Keep a set of dumbbells around if you can’t get to a class, conscious of proper technique. Activity will require more recovery time. Stretch after every workout no matter what. Pilates and yoga will help you recover and stretch while maintaining strength and increasing flexibility. Strength and flexibility become synonymous with health. 60s & 70s: Joint health becomes a focus, so don’t give up on fitness. We’re not saying run a marathon, but don’t let aches and pains hinder working out. Adapt your workout, low impact rules. Enjoy long walks. Resistance training is still important, but using lighter weight will relieve joint pain while lifting. This isn’t the time to max-out on your bench press. Stretching and practicing balance postures are also essential. If you don’t stretch now, the flexibly in your joints when you’re 80 will be completely lost. 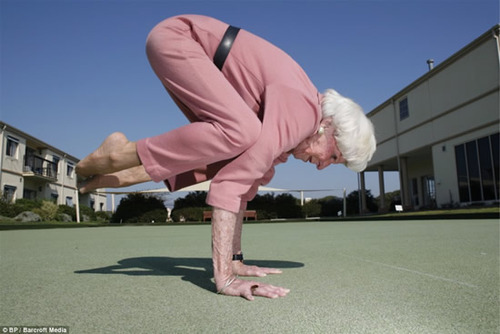 Pilates can aid in flexibility as well as balance, both of which will carry you through the golden years with grace. Last weekend I joined a few long lost friends in Vegas for a laughter fest celebrating a mutual dear friend’s last few weeks as a single lady. The roster was a grip of gals from less refined years at Michigan State University. I used this weekend’s desert get-away as my reward as well as my motivation for this past month’s HIP’s 90 Day Challenge. It was sure to be a weekend of cheating on clean eating as well as an arena to test out the new bikini bod. After being diligent with my whole foods, portion control and extra cardio and ab workouts I felt I was ready for a reward, but I didn’t want to derail my success. It turned out, we all had grown quite wise since our college years. A group of angels in Sin City. We had a suite in a non-smoking hotel and took it upon ourselves to bring in as much food as possible for the weekend. Veggies, hummus, cheese, wine, even rotisserie chickens (for protein) along with plenty of water, sunscreen and a lot of dancing made the weekend a success and complementary of our fit lifestyles. We’re still patting ourselves on the back for our good decisions. I will admit to unwrapping a few packaged food items, but I have to say it was a weird feeling. I hadn’t torn open a single serving package in over two months and it made me take note of the act. Not only was the food inside bland and a little on the sweet side, but I found the crinkle of the wrapper itself to be a turn off. Not a present I couldn’t wait to tear into. The foil felt foreign, low quality and cheap. It was a realization that my efforts to eat clean had raised my standards for nourishment. In that moment I gained a full appreciation for all the time and effort of my food preparation during the past 60+ days. As for the bathing suit fashion show, I’m not exactly to my goal, but I’m feeling great about my progress. And the bride to be… she’s been slimming down for her wedding day by eating clean and incorporating 2-a-day workouts, she has the abs to prove it. Certainly an inspiration for my last 30 days on the challenge! Memorial Day is 6 weeks away, will you be wearing white? Part of a strong core is strong glutes and strong glutes don’t look half bad in a pair of white shorts. When you burn the booty don’t forget about the other stabilizers like your abs and inner thighs. They are all working together to lift that bum and tone all over. If it’s your posterior you want to target, doing a little extra of these mat Pilates exercises while watching TV can make a difference that’s black and white. Color of your pants, that is! Shoulder Bridge - Lying on your back, knees apart and bent, feet flat on the floor. Squeeze the glutes and hamstrings and raise the pelvis off the floor to the sky, pressing evenly into both feet. Repeat the lift and lowering of the pelvis, keeping the abs engaged to prevent the load from going into the lower back. The neck and shoulders stay relaxed on the mat. For more of a challenge lift one leg up to the sky and lift and lower then switch legs and repeat. Side Leg Series - Lying onto one side, line the back of your body up with the edge of the mat and cradle your head with the bottom arm. Maintain that straight line from head to toe, supporting with the top arm if necessary and lift the top leg to hip height. Lower and lift the leg, pointing the foot on the lift and flexing on the lower. Next, keep the leg at hip height and draw small circles to the front and then reverse, using the core to keep the pelvis stabilized. After that, lift the top leg up to hip height and bring the bottom leg up to meet it. Then lift both legs at the same time. Repeat each exercise for 5-10 reps before moving onto the other side. Leg Lifts Prone - On your forearms and knees (or your palms of your hands if that feels better) straighten one leg behind you and then bend it in half like you’re going to poke the ceiling with your toe. Just like bungee kicks (without the bungee) little pulsing lifts to target the crease of your seat where the hamstring meets the glute. Think of tucking your tailbone under and rounding your back to not only engage your abs, but also protect your lower back and making your glute work harder. Repeat on the other side. Fun fact: The word Gluteus is derived from the latin word meaning Rump! Workout your rump for summer! It’s good you know your core and how it functions. Beyond looking awesome while baring the midriff, your abdominals workouts benefit more than your fashion sense. If you think about it, your abs literally hold you up right and protect your internal organs. There isn’t much between your ribs and pelvis, your abs are your armor. Rectus Abdominis – The coveted six-pack and the most superficial abdominal muscles. It’s a long and flat muscle that runs vertically between the pubis and the sixth and seventh ribs. The Rectus is responsible for flexing the spine. Any time your ribs get closer to your pelvis, that’s your rectus abdominis at work. It also helps to stabilize during side bending and twisting. External + Internal Obliques – Brothers working together for side bending and spinal rotation. The fibers of both muscles run opposite one another diagonally. External fibers point to the hips like putting your hands in your pockets and internal the opposite way. External run from your 5th to 12th ribs down to the side of your hip and kissing the Rectus Abdominus while the internal run all the way to your lower back. The internal and external oblique on opposite sides work to rotate the torso one direction and the same side internal and external are used to bend sideways. Transverus Abdominus – Meet the deepest layer of muscles in the abdomen. The Transverus Abdominus or TA, is foundation of spine stabilization in addition to aiding in respiration. Think of the transverses as the ice under the six-pack. What’s the point of a beverage if it isn’t frosty? The fibers of this muscle run horizontally around the font and back of the body, feeling like a corset tightening slightly when engaged. Drawing the navel in to stabilize the spine, a strong Transversus protects the lower back along with weight regulation along the vertebral column and pelvis. Hip Flexors – No, not really abdominals, but abdominal helpers. Your hip flexors bring your legs to your torso in aid of full flexion. It’s really important to be mindful when you do abdominal exercises to stay out of the hip flexors. Modify if you begin to feel strain in this muscle group. The best way to isolate the abdominals is to minimize the involvement of the hip flexors. If you think about it, your abs literally hold you up right and protect your internal organs. There isn’t much between your ribs and pelvis, your abs are your armor. How strong is your armor? Plucked from your sacred routine and sent out on location for an assignment. You’ve found yourself in a climate you’re not accustomed to, and the locals think a salad is iceberg lettuce drown in ranch. However, your employer has sprung for a hotel room designed for your every comfort. Well almost, they call a broken treadmill in a carpeted closet their state of the art fitness facility, but you aren’t buying it. You didn’t pack dumbbells or a mat, let’s face it, your bag just makes weight as it is. So what can you do? Try this 40-50 minute workout from inside your hotel room. Turn on your favorite tunes and tune out the ugly bedspread. This is your gym now. Use the stopwatch on your phone or the second hand on your wristwatch and use a bath towel as a mat. It might not be HIP Studio but it’s close enough! Circuit Workout - Repeat each circuit 3 times before moving on to the next. 30 reverse crunch or hip raises (lower abs work, legs extended to the sky). Stretch hip flexors, hamstrings, glutes, spine twist and extension as needed.